Senior Revolutionary Guard official explains the 'problem' of Israel's existence, says Hezbollah has over 100,000 missiles ready for launch. 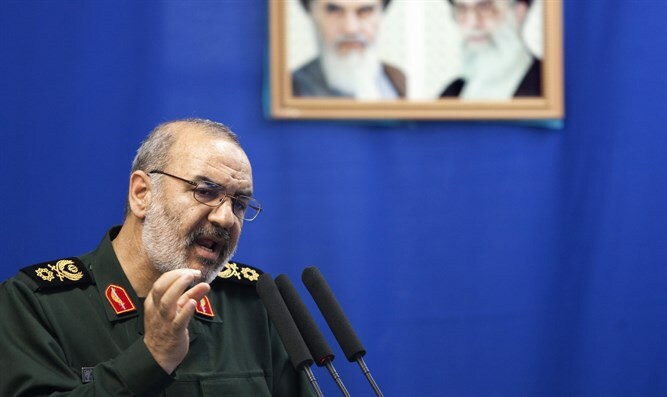 Iranian Revolutionary Guard Deputy Commander Hossein Salami promised to fight Israel from Lebanese soil, the Middle East Media Research Institute (MEMRI) reported. Speaking at an al-Quds Day event in Mashhad, Iran, Salami explained his rationale for destroying the State of Israel. He also explained that the "problem" of the State of Israel's existence could be solved primarily by using the "mighty power" of the Iranian-backed Hezbollah terror group. MEMRI researchers translated Salami's speech, which was titled "The problems of the Islamic world stem from the existence of the false, counterfeit, historically rootless, and identity-less regime named Israel." "Seventy years have passed since the policy of England and America planted in the Islamic world an accursed and criminal tree [i.e. Israel]," Salami said at the event. "For 70 years, this poisoned dagger has been embedded in the body of the Islamic ummah, and all the problems of the Islamic world stem from the existence of the false, counterfeit, historically rootless, and identity-less regime named Israel." "In addition to the threat to Palestine's existence, the Zionist regime constitutes a threat as well to the entire Islamic world. That is the philosophy of the establishment of this regime: ... [Israel] brings the range of America's missiles against the Islamic world 12,000 kilometers closer, and becomes a tool for imposing America's policy against the Islamic world. "The Imam [Ayatollah Ruhollah Khomeini] spread the rationale of eradicating Israel [from the world] as a new notion in the world's political discourse... Since then, the Zionists have not succeeded in triumphing over the Muslims in any war." Noting that Hezbollah has "over 100,000 missiles ready for launch," Salami promised that "today has tremendous might on the ground that can on its own break the Zionist regime. The Zionist regime has no strategic-defensive depth." "In some places, the breadth of this regime is barely 34 km, and in order to destroy it, it will take only one 'Jerusalem operation' to destroy it," he emphasized. The "Jerusalem Operation" was Iran's name for its operation against Iraq during the Iran-Iraq war in the 1980s. According to Salami, Palestinian Authority terrorists are now "armed with missiles" and every Israeli site is now "under fire from the missile launchers." Salami continued to explain how Israel's recent wars, including both the Second Lebanon War and Israel's operations in Gaza, have all shown that "the more time passes, the weaker the Zionist regime and its allies become," emphasizing that "the Zionists are paralyzed and fear death" but "their fate is sealed." He also noted Israel's lack of response to the missiles fired from Syria towards Israel's Golan Heights, bringing it as further proof of Israel's weakness. Salami also promised that Iran "will not disarm," even though the world wants to "weaken the foundations of our might." "We must squeeze the throats of the enemies from afar. We must give them no chance to come near us, or to focus on us. We are monitoring them from afar, and grabbing them by the throat in other places. "We are creating might in Lebanon because we want to fight our enemy from there with all our strength. "The Iranian people pursues the enemy everywhere in the world, and does not allow this country to be in danger," Salami concluded.